Jean Froissart was born in the 1330s and died after 1404. Although he was formally a clergyman and held various eccesiastical posts, he devoted himself to literature. His works include romance, poetry, and history, and could easily have been written by a layman -- there is nothing particularly "clerical" in his point of view or method of expression. Indeed, Froissart's most famous and significant work, his Chronicles, was aimed at a knightly and aristocratic audience, and was devoted to "the honorable enterprises, noble adventures, and deeds of arms, performed in the wars between England and France...to the end that brave men taking example from them may be encouraged in their well-doing." Froissart's historical efforts won him the patronage of the highest nobility during his own lifetime and his works were often copied afterwards. For centuries, Froissart's Chronicles have been recognized as the chief expression of the chivalric revival, if revival is the word, of fourteenth-century England and France, and as a key to the aristocratic self-image of the time. His history is also one of the most important sources for the first half of the Hundred Years' War, and certain events of the era, such as the battles of Crecy and Poitiers and the English Peasant Revolt of 1381, are best known to many readers through the his often-reprinted accounts of them. Excerpts of Froissart's Chronicles (which are very long) are available in print (notably in a recent Penguin Classics edition) and on the World Wide Web. Much of Froissart is, however, unavailable to most people, whether in the original French or in English translation. This is my own effort to make more of Froissart available electronically to readers of English. It may be possible at some point to put a complete English Froissart on the Web; at the moment, though, I am restricting myself to posting sections and episodes that I find interesting, either for their inherent drama, for their military or social detail, or for their ability to reveal certain attitudes and values of Froissart or his audience. I have taken my excerpts from an 1849 edition of the Thomas Johnes translation (1805). This is the most recent complete or near-complete translation of Froissart. No doubt there are flaws in the translation and certainly more reliable texts of Froissart are available now than in Mr. Johnes' time; but I believe that putting Johnes' version on the Web will meet the needs of some students and readers. Warning to readers: I have left Johnes' language and spelling just as I found it. This means that when he calls some French comtes "earls" and others "counts," I have made no effort to make the text consistent. Likewise, I have not corrected his transcription of personal and place names. The problems with proper names go back to Froissart himself and have bedevilled even the experts. Finally it should be said that even though Froissart was a contemporary of the events he recorded and relied as much as possible on eye-witness accounts, his accounts contain many errors, even important ones. If you want the facts, as far as they can be ascertained by careful scholarly investigation, modern accounts are much more reliable. Froissart gives us something that modern historians cannot: stories that he and his audience found interesting. His "tales" therefore give us access to how some people of the fourteenth century thought and talked about war and politics. French texts of Froissart now available on the Web! There are now two French versions of Froissart on the World Wide Web. One is the 19th-century scholarly edition of Kervyn de Lettenhove; the other is a translation of Froissart into modern French by Buchon. Both of these documents can be found at a site run by the Bibliothèque National de France, Gallica. To access them (through an interface using Adobe Acrobat), use the search engine available from that site. Feel free to contact me with corrections, suggestions, or just plain chat. Lord James Audley at the battle of Poitiers. Why the Prince of Wales waged war on Henry of Trastamara. The ransom of Bertrand du Guesclin. Both French and English bishops preach war. Sir John Chandos rescues the Earl of Pembroke. The death of Sir John Chandos. Sir John Assueton performs a notable deed at Noyon. The garrison of Noyon execute English prisoners. The Prince of Wales' revenge on Limoges. A venturesome knight is felled by a butcher. Three episodes concerning captive warriors. The lord de Boursiers on the Somme. The lord de Coucy turns French. A battle near Cherbourg, 1379. A few Scots capture Berwick. The Scots defeat the English near Melrose. The death of the lord de Langurant. The Count of Flanders detains a French ambassador. Hostility grows between France and Flanders. Two captains harass the French party in Auvergne. English and French captains fight in the Italian wars. How the wars in Flanders began. Gilbert Matthews plots against John Lyon. John Lyon exploits dissatisfaction in Ghent. A challenge is fought before the Earl of Buckingham. French and English knights tourney in Brittany. Nicholas Clifford kills a French squire who had challenged him. Beginning of the English Peasant Revolt. Death of Sir Robert Salle in the Peasant Revolt. King Richard punishes the rebels in Kent. High words between Lancaster and Northumberland. The death of the lord d'Anghien. The massacre of the peace party in Ghent. Paris rebels against the king. The English in Portugal mutiny. A French knight and an English squire joust. The earl of Flanders gives harsh terms to Ghent. The Mallotins rise in Paris. Artaveld speaks to the people of Ghent. The men of Ghent defeat Bruges and the earl. How the earl of Flanders hid from the men of Ghent. How the men of Ghent acted in victory. How the earl of Flanders escaped from Bruges. Ghent attacks the gentlemen of Flanders. The French dukes opt for war. The Haze de Flandres leads a foolish expedition. The French army forces a river crossing. The French prepare for battle at Commines. The constable remains in his office. The count de Blois saves Hainault from various menaces. Peter du Bois rallies Ghent. The king punishes the Parisians. The king overawes the towns of France. Sir Hugh Calverley is discouraged by the power of the King of France. Francis Atremen takes Oudenarde by surprise. Aymerigot Marcel takes Marquel by strategem. Bourbourg is plundered after the English surrender it. The funeral of the Earl of Flanders. French knights face danger in Zealand. The Porkers make war on all mankind. Francis Atremen defeats the French at Ardembourg. Bernabo Visconti is deposed by his nephew Gian Galeazzo. The Duke of Bourbon's troops take the bridge at Taillebourg. The French are treated badly by the Scots. Ardembourg is almost taken by the men of Ghent. The men of Ghent escape from Damme. Sir John Holland kills Lord Ralph Stafford. The Scots and English each invade the other country. The Admiral of France is held hostage by the Scots. How peace was plotted in Flanders. An assembly of the people of Ghent chooses peace. Peter du Bois retires from Ghent to England. Froissart explains his visit with the Count de Foix. How the ransom of the Count d'Armagnac was reduced. How the castle of Lourde dominated a wide area in France and Spain. Sir Espaign du Lyon tells Froissart how the garrison at Lourde took Ortingas. The capture of Casseres by the Armagnacs. How the Count of Foix forced the pass called la Garde. The duke of Anjou reduces strongholds in the south. The strength and wealth of the count of Foix. The garrison of Lourde suffers a setback. How the duke of Anjou attempted to win the castle of Lourde. The history of the count de Foix. Froissart arrives at Orthès and meets the count de Foix. The death of the count de Foix's son. The career of Bastot de Mauléon, man-at-arms and brigand. The king of Portugal marches to meet the king of Castile. The Portugese and Castilian forces prepare for battle. The Battle of Aljubarota, 1385 (first version). How Espaignolet took Ermaille twice. Sir Walter de Passac recovers St. Forget. Ernauton de Batefol gains favorable terms. The character of the English and the Gascons. The life-and-death duel between James le Gris and John de Carogne. A deed of arms at Bordeaux before Sir John Harpedon. The marriage of the King of Portugal and Philippa, daughter of the Duke of Lancaster. A strategem leads to the fall of Ferrol in Galicia. A battle at the barriers at Noya. The duke of Brittany arrests the Constable of France. A deed of arms is not accomplished. A deed of arms at Montereau sur Yonne. A deed of arms at Bordeaux before the duke of Lancaster. The grand entrance of Queen Isabella into Paris, and the pageants and tournament that took place. Three chamberlains of the king of France propose a deed of arms. The tournament of St. Ingelvert. An analysis of the action. Another account of St. Inglevert. A combat of ten Christians against ten Saracens fails to take place. The Count d'Ostrevant attends a great tournament in London and gets into trouble. King Richard's invasion of Ireland. King Richard's tournament is a failure. Tales told by Sir Espaign du Lyon. The campaign of Aljubarota, first version (incomplete). Sir Walter de Passac's campaign against the plunderers in the Toulousain (incomplete). 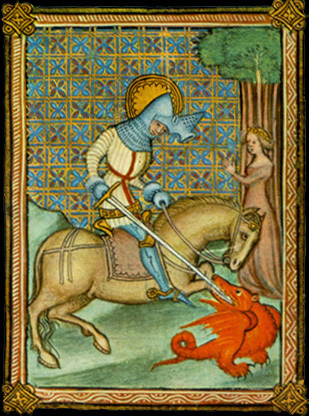 The Age of Charles V.
Many of the images are from manuscripts of Froissart. Jane Zatta, at Southern Illinois University (Edwardsville Campus), has selected some of these illuminations and added a brief English commentary. Her site is called Some Important Events in the Fourteenth Century. The Bibliothèque National de France has made available the Kervyn de Lettenhove scholarly edition of Froissart (in Middle French) and the Buchon translation (into Modern French) at Gallica. Dr Godfried Croenen at the University of Liverpool has posted an extensive bibliography of Froissart's works and works about Froissart. The Jean Froissart Project of the University of Sheffield and the University of Liverpool now has a web site. The Friends of Hafod newsletter reprinted Walter Scott's 1805 review of the first printing of Thomas Johnes' translation of Froissart. Thanks to the generosity of the editor, Caroline Kerkham, the review is now here. Harvard University's Geoffrey Chaucer Page includes excerpts from the Scrope-Grosvenor Trial (1385-1390), during which some English knights and squires briefly described their own careers in arms. Deeds of Arms: A Collection of Accounts of Formal Deeds of Arms of the Fourteenth Century. I owe the illuminated knight above to the generosity of Brian R. Price of the Knighthood, Chivalry & Tournaments Resource Library and the Company of St. George. Feel free to contact me at stevem@nipissingu.ca with corrections, suggestions, or just plain chat. Last revised January 21, 2004.